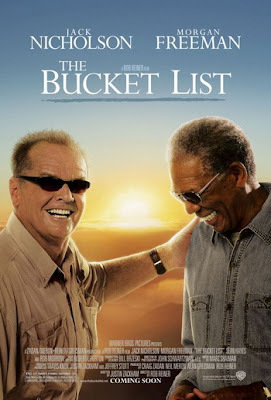 The Bucket List (2007) was another one of those movies I should have watched ages ago, but then it came on TV for the Easter break and I didn't need to bother to get it out on DVD. I mean, it's not like I was really excited to see Jack Nicholson and Morgan Freeman sharing the screen (cough cough). Edward Cole (Jack Nicholson) is a wealthy man who has just been diagnosedd with terminal cancer. He shares a hospital room with Carter (Morgan Freeman), who has never really experienced life to the limit as Edward has. Carter hass been writing a 'bucket list' for a while now, which has all the things he wants to do before he dies. Edward decides to help him complete this list, becoming good friends in the process. Look at it this way: if Jack Nicholson and Morgan Freeman weren't in this it probably would have been as flat as a pancake. They carry this film with all the charm and charisma they have, but they aren't playing in extremely different characters. Jack is still a womanizer and Morgan is still an old man full of wisdom from his years. The Bucket List is nothign special. It does have some delightful humour and some truly heart warming bits to it, but you do know how it will end, and it's a little weak. However, the older generation will like it a lot, because it has the kind of stuff in it that they can understand a whole lot better than us youngins.